Preferred Habitat: Dense swamps and moist woodlands. Seasonal Occurrence: Common throughout the year. Nests in our area. 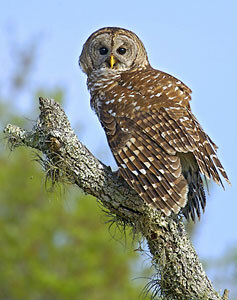 Notes: Barred Owls are large, stocky owls with rounded heads, no ear tufts, and medium length, rounded tails. They are mottled brown and white overall, with dark brown, almost black, eyes. The Barred Owl’s hooting call, “Who cooks for you? Who cooks for y'all?” is a classic sound of old forests and treed swamps and may often be heard in the daytime. Originally a bird of the east, during the twentieth century it spread through the Pacific Northwest and southward into California. The expansion of its range has had a significant detrimental effect on the threatened Spotted Owl as they compete for food and nesting sites. Barred Owls are common throughout the year in Houston and nest in our area. One of the best sites to look for Barred Owls in Houston is along Patterson Road, on the southern boundary of Bear Creek Park and along Sharp Road, in far northwest Houston (Katy Prairie).